What are the “toolkitgenes” for social behavior? Identifying the fundamental and evolutionarily conserved genes and genomic responses underlying social behavior is an overarching goal of the Sociogenomics Research Coordination Network. A collaborative project by RCN members at the University of Illinois Center for Genomic Biology has begun to explore this question with a comparative study of the brain’s response to a biologically important social challenge, a territorial intrusion. The project involving the labs of Allison Bell, Jian Ma, Gene Robinson, Saurabh Sinha, and Lisa Stubbs is supported by the Simons Foundation. The first paper describing the results of this effort has now appeared in PNAS. A principal idea behind the Sociogenomics RCN is that that social behaviors evolved within a framework of conserved neural and genomic mechanisms, onto which taxon-specific processes may have been added. Studying carefully selected, diverse animal models in a rigorously controlled way provides an opportunity to discover both the evolutionarily conserved, core mechanisms, of social regulation and the evolutionary diversity within them at the molecular level. Drs. Robinson, Bell, and Stubbs have taken this approach in an initial study targeting the brains response to social threat. 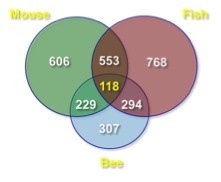 Working with bees, stickleback fish, and mice respectively, their three labs staged similar social threats in the form of a territorial (or colony in the case of bees) intrusion by an unfamiliar conspecific individual, then examined the suite of brain genomic responses that ensued in the challenged individuals. Compared to control individuals, a large number of genes were up- or down-regulated in response to the social situation. The array of common genes likely contains some general regulatory transcription factors that respond to any neural change, but may also include genes and related gene networks whose expression patterns represent a common pathway underlying the brain’s response in a social situation. Many of the genomic changes identified to date involve changes in the expression of transcription factors. In addition, changes in chromosome organization and energy metabolism appear to be core, conserved processes involved in the response to the simulated territory threat. Elucidating the molecular basis of social behavior presents a formidable challenge. Nevertheless, the success of this project so far shows that progress can be made through Sociogenomics Initiative’s collaborative and comparative approach. As the work progresses and expands to other species and other social conditions, a deep understanding of the molecular processes underlying social behavior and the brain could emerge.